A few weeks ago, I suggested property values in Loughborough would be between 1.4% and 2.4% different by the end of the year. It might surprise some people that Brexit hasn’t had the effect on the Loughborough property market that most feared at the start of 2018. The basis of this point of view can clearly be seen in the number of property transactions (i.e. the number of property sold) that have taken place locally since 2008. The most recent property recession was the Credit Crunch years of 2008, 2009 and 2010. In property recessions, the headline most people look at is the average value of property. Yet, most people that sell also go on to buy, so for most home movers they will find that although their property has gone down in value so has the one which they want to buy. Therefore, in theory, you are no better or worse off. If you are moving up market - which most people do when they move home - in a repressed market the gap between what yours is worth and what you will buy gets lower in a repressed market, meaning that you will be better off. 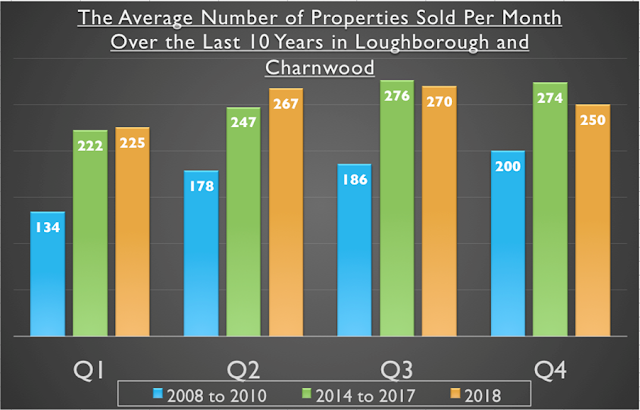 In the 2008 - 2009 property Credit Crunch recession, the average number of properties sold in the Loughborough and Charnwood area were 174 per month. Interesting when we compare that to the boom years of 2014 to 2017, when an average of 255 properties changed hands monthly. Yet in the supposed doom laden year of 2018, an impressive average of 253 properties changed hands monthly meaning that 2018, compared to the boom years of 2014 to 2017, saw a drop of 0.7% - yet still 45.4% higher than the Credit Crunch years of 2008 to 2010. 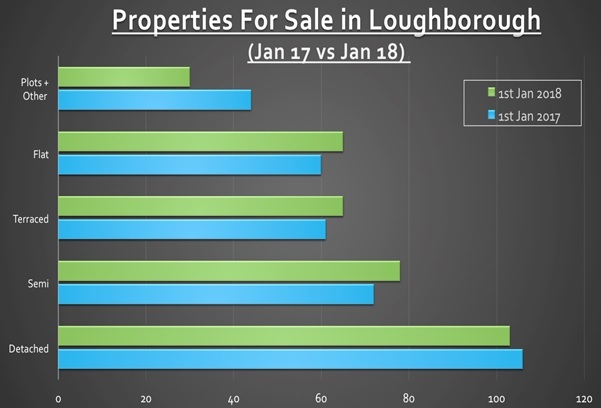 The simple fact is, the fundamental problems of the Loughborough property market are that there haven’t been enough new homes being built since the 1980’s (and I don’t say that lightly with all the new homes sites dotted around the locality). Also, the cost of buying your first home has remained relatively high compared to wages and, to add insult to injury, all those issues are armour-plated by the tougher mortgage rules which were introduced in 2014 and the current mortgage market conditions. It is these issues which will ultimately determine and form the rather unexciting, yet still vital, long term outlook for the Loughborough (and national) housing market. I feel the Brexit issue over the last few years has been the current passing diversion for us to worry about. Assuming something can be sorted with Brexit, long term property values in Loughborough will be constrained by earning increases with long term house price rises of no more than 2.5% to 4% a year. As a Loughborough homebuyer, one shouldn’t be thinking of what is happening in Westminster, Brussels, Irish Backstop, China or with Trump and should be more focused on your own personal circumstances. Do you want to move to get your child in ‘that’ school or do you need an extra bedroom for your third child? For lots of people, the response is a resounding yes - and in fact, I feel many people have held back. So once we know what is finally happening with Brexit, and the future of it, there could a be a release of that pent-up demand to move home as people humbly just want to get on with their lives. There is little to be lost in postponing a house purchase until there is better clarity on the situation. If it isn’t Brexit it will something else - so just get on with your lives and start living. We got through the global financial crisis; Credit Crunch in 2008-2009; Black Wednesday in 1992 where mortgage interest rates went from 8.5% to 15% in one day. We got through the worst stock market crash with Black Monday in 1987, hyperinflation, power shortages, petrol quadrupling in price in less than a year and a 3 day week in the 1970’s. Need I go on? Loughborough Landlords? Well, where else are you going to invest your money? Like I said earlier in the article, we aren’t building enough homes to keep up with demand, so as demand outstrips supply, the house values will continue to grow. Putting the money in the building society will only get you 1% to 2% if you are lucky. In the short term though, there could be some bargains to be had from shortsighted panicking sellers and in the long term - well, the same reasons I gave to homeowners also apply to you. If you are interested in talking about this or potential investments, please feel free to call me on 01509 260777 or email me. It’s now commonly agreed amongst economists and the general public that the dramatic rise in Loughborough property prices of the last six years has come to an end. Read the National newspapers, and they talk of doom and gloom in the British housing market with such things as strained buyer affordability (as property prices have increased over the past six years at a far faster pace than average salaries); a lack of new properties being built; and the Brexit uncertainties over the last two and half years being blamed for the slow down. 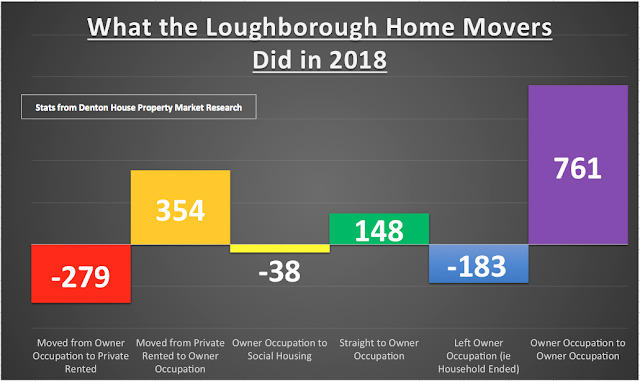 Yet in the last 12 months, people have still been moving, buying and selling in Loughborough at levels similar to the last six years - something tells me we have a case of ‘bad news selling newspapers’.